Get ready to dazzle your guests with this very simple DIY from blog.beau-coup.com! Thank you Beau-Coup for this great tutorial! 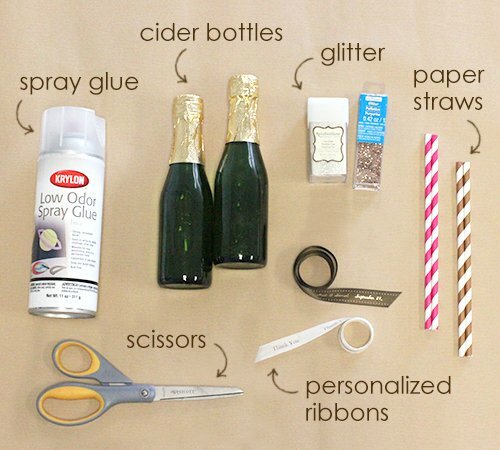 Spray the cider bottle with the glue and let sit for 5 minutes. 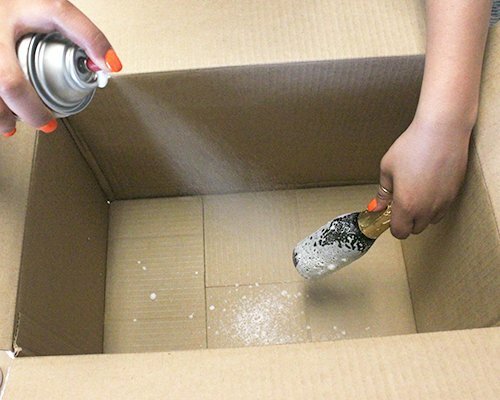 You can use a paintbrush to further spread it if it doesn’t spray on evenly. [PRO TIP] This part can get messy, so apply the glue inside of an open top box for easy clean up. 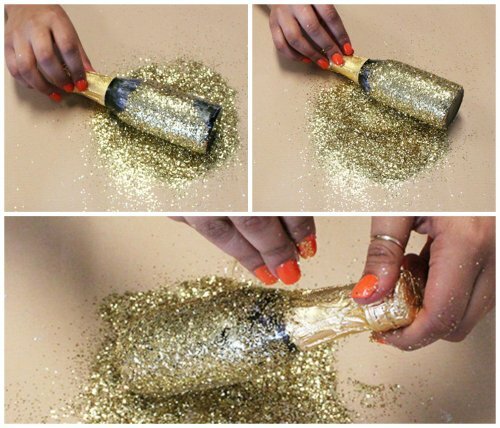 Create a pile of the coarse glitter and roll the bottle through the glitter pile as evenly as possible. [PRO TIP] Pour glitter pile on top of construction paper for easy clean up. Repeat this process a few times to attain as full of coverage as possible. 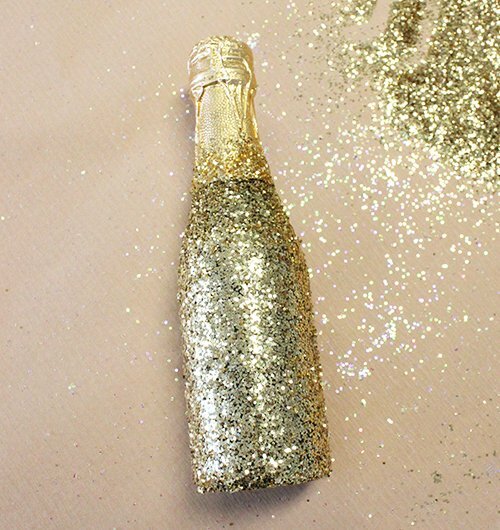 Use your fingers to add glitter to the “naked” portions of the bottle as necessary. 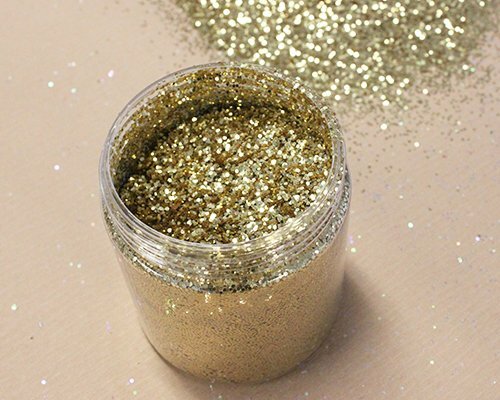 [PRO TIP] Use additional glue and glitter as required to cover any bare spots. Use a silicone or lacquer sealer afterwards to keep the glitter in place. You did it! 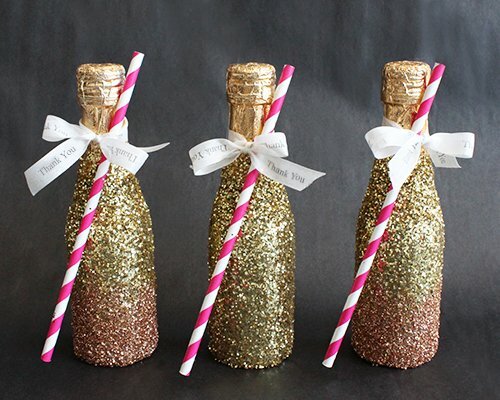 You’ve successfully glittered your bottles for a decadently elegant look. Now finish the project by tying a decorative straw and personalized ribbon to complete the look for a gorgeous presentation. This cute finished project is a delicious treat that guests can enjoy at the party or bring home as a unique souvenir! [PRO TIP] For an ombre effect, add a little glue to the bottom of the completed bottle. Using a fine glitter with a different color, sprinkle along bottom of bottle.